Speaking of Martha Stewart, I never thought I would see a chair with this color combo grace the pages of Martha Stewart Living. I'm totally digging it and I might paint my chair yellow now....way to go Martha! Really love it! Such a surprise. Very unexpected! I really love it! At first glance it looked like an old tear-out I have from Real Simple. Surprising! I may have to go pick up the mag and read the rest. I saw it last night and loved it. And I'm usually not into bright colors. But loved the combo. Great color combo! The teal looks fantastic paired with the yellow. Definitely unexpected and inspirational! I just found your blog and love it! I'm a huge MS fan. No kidding. This is so much fun it makes me want to paint something yellow too! I thought this was a great issue. I was so happy to see "home issue" on the cover -- I've been missing their homes stories! Oh that Martha (or rather, all her peeps) know how to keep it interesting - and up to the minute cool! 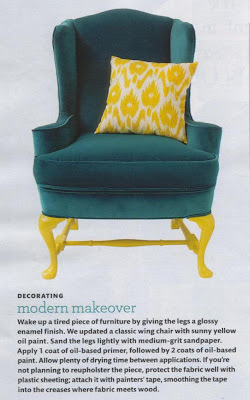 you should paint your chair turquoise and recover it in the schumacher dragon fabric!!!!!!!!! !